Container shipping began in its current form in 1956. In 1961, the International Organization for Standardization set standard sizes for all containers. Prior to standardized container shipping, a manufacturer packed their goods onto a ship. Those goods were then unpacked from the ship and packed onto a train or truck. Container shipping services are important to global trade. Whether you are purchasing tennis shoes from China or leather goods from Australia, having an economical way to ship those goods is necessary. That is where container shipping services come into play. Container shipping uses standard sized containers of 20 foot (6.09 meters), 40 foot (12.18 meters), 45 foot (14.6 meters), and 53 foot (16.15 meters). Twenty-foot Equivalent Unit (TEU) is the standard measure. Containers are built to international standards making them interchangeable between shipping companies, and rail and truck companies. The different types of containers include open end, open side, open top, half height, flat rack, refrigerated, liquid build (tank), modular, and standard dry cargo. By using standardized shipping containers, ships, trains, and trailers can be loaded and unloaded efficiently. This makes goods more affordable than if the containers were loaded and unloaded at each stop along the route. When selecting a container shipping service, keep in mind what you are shipping. There is more to selection than the bottom line price. Are you shipping fruit, chocolate, or seafood? If so, you want to choose a service that utilizes specialized refrigerated containers where temperature control is possible. If you are shipping machinery or odd-sized equipment, you want a service that utilizes open top or flat rack containers. These more easily handle a product that will not fit in a standard closed container. Other examples of types of containers to use: open top is ideal for logs, machinery, and odd-sized items. Flat racks are ideal for boats, vehicles, machinery, industrial equipment. Open side is ideal for vegetables such as onions and potatoes. Tanks are used for chemicals, wine, vegetable oil. Cargo Ships: Liner shipping is transported by ocean-going ships that travel set routes on fixed schedules. According to the World Shipping Council, there are "approximately 400 liner services." Air Freight: Airplanes are faster but haul much less freight. They are, therefore, more expensive and less environmentally friendly. Rail Freight: Rail is an efficient way to transport freight from a seaport to a destination across the country. Containers are moved by crane from the ship to a railroad car. Truck Freight: A container may be loaded directly from a cargo ship or a railroad car to a tractor-trailer without having to physically touch the product. 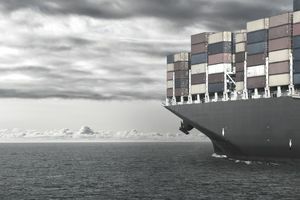 Goods transported by ship can be loaded and sealed right at the manufacturer and remain that way until they arrive at the purchaser's warehouse. The manufacturer works with freight forwarders to arrange transport from manufacturers. The trucking company arrives at the manufacturer and loads the product into a standardized container. Customs is the only entity that may open a sealed container for the purpose of inspection until the container reaches its final destination. The freight forwarder decides the most cost-effective port from which to ship. Pricing is always going to be a key component in choosing a container shipping service. In addition to cost, it is important to choose a service that has a reputation for shipping successfully the type of product you are shipping.